The BRICS New Development Bank (NDB) will not be limited to developing countries and could allow other UN member states to join, Brazilian Minister of External Relations Mauro Vieira told Sputnik. "The bank, as it is known, will finance infrastructure and sustainable development projects in BRICS states and other developing countries. Over time, it could allow other UN member countries to join," Vieira said. The foreign minister added that the bank is currently working to ensure that it starts issuing loans at the beginning of 2016. Five major developing economies – Brazil, Russia, India, China and South Africa – envisage their venture as an alternative to existing global financial institutions, such as the International Monetary Fund (IMF). 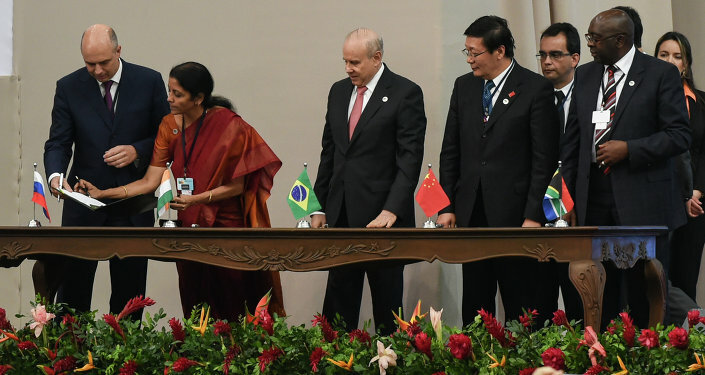 On Wednesday, President of the Brazilian Development Bank (BNDES) Luciano Coutinho told Sputnik on the sidelines of a BRICS summit that NDB will start off by giving financial support to the five founding countries and will gradually extend support to all emerging markets. The seventh BRICS summit is being held in the Russian city of Ufa on July 8-9.